Spinster sleuth Miss Marple returned to Masterpiece Mystery last Sunday with her sensible shoes and ingenious deductions in one of Agatha Christie's venerable warhorses, The Mirror Crack'd from Side to Side. What true classic mystery aficionado has not seen one of the movie adaptations of this wonderful 1962 book of the same name? It has been trotted out no less than two times prior to this new production showcased by former Miss Marple's: Angela Lansbury and Joan Hickson. Now Julia McKenzie gets her chance to slip into the Marple mantle and solve a double murder at a grand manor house in her own village of St Mary Mead. I saw this remake, and was terribly disappointed by the liberties taken in amending the original story. Julia McKenzie bears no resemblance to Ms. Marple, and the story line and cast did not do this classic mytery justice. There can't be any better Ms. Marple than Joan Hickson, who filled this role with style and class. Hi! 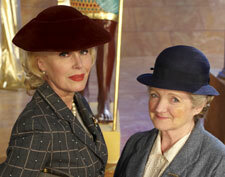 I like all 3 ladies who have portrayed Miss Marple on Mystery! and treat each as a different interpretation. Margaret Rutherford, Angela Lansbury and Helen Hayes have done versions of the great elder detective as well. It's like all the Sherlock Holmes portrayals-you just have to take each as it's presented.